at thousands of hotels worldwide. fantastic rewards and lifestyle benefits. funds for your favourite charity for free. 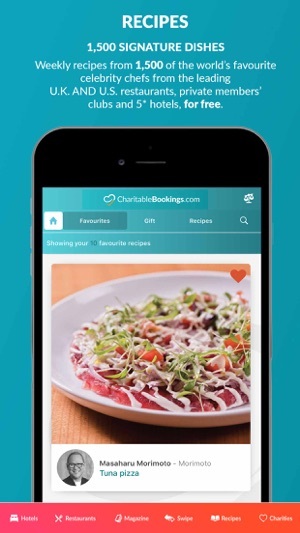 CharitableBookings.com, the free lifestyle platform that has fantastic rewards, benefits and also gives money to your favourite charity for every honoured booking you make at absolutely no cost to you. 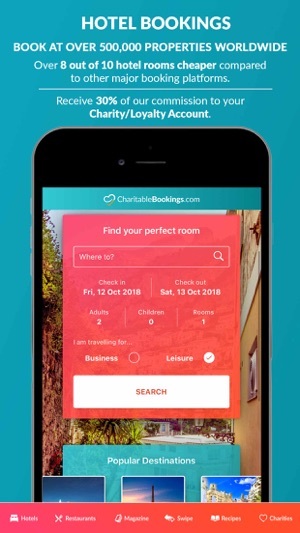 Book at over 500,000 hotels across the world and CharitableBookings.com will donate 30% of the commission received from all your hotel bookings to your Charity/Loyalty Account. Over 8 out 10 hotel rooms cheaper when compared to all other major booking platforms. Book at over 8,000 restaurants across the U.K. via telephone or online and enjoy Deals and Secret Tips for the best tables to ask for when booking. 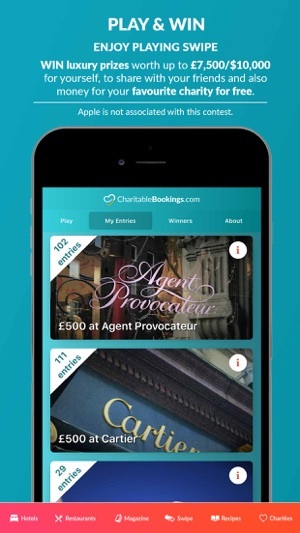 Enjoy playing Swipe daily for the chance to WIN money for your favourite charity and individual prizes worth up to £7,500/$10,000 at the worlds most luxurious brands including: Harrods, Agent Provocateur, Louboutin, Gucci, Dunhill, Prada, Cartier, Tiffany and many more by simply swiping YES or NO daily for free. Enjoy weekly Signature Dish recipes from 1,500 of the best loved celebrity chefs from the leading U.K. & U.S. restaurants, private members clubs and 5* hotels for free. Enjoy articles for free on the go from the worlds of luxury and philanthropy. 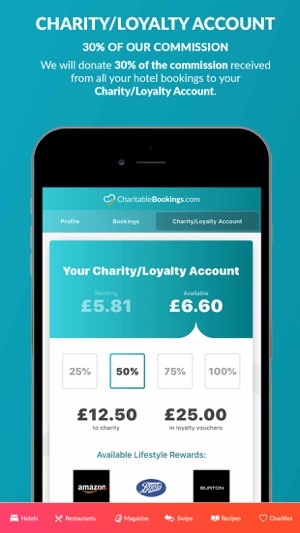 Receive with all honoured hotel bookings 30% of the commission we receive to your Charity/Loyalty Account. Donate a % of your total account to your favourite charity and enjoy the remainder to spend on lifestyle vouchers for yourself from leading brands including Amazon, M&S, Eurostar, John Lewis/Waitrose and many more. We update regularly and always listen to our users to make improvements. If you have any feedback do please let us know. 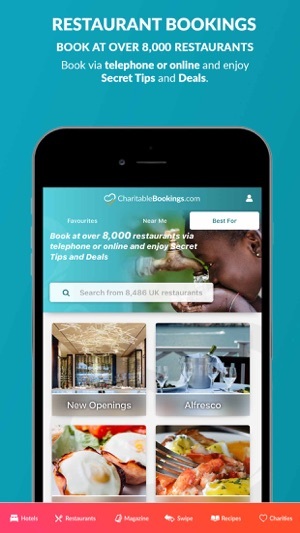 This is a great app very easy to use and find your favourite restaurants and your chosen charity will receive money every time you book through the app. I love this! Every time I book a restaurant money goes to a charity I support! What’s not to like. And the ‘near me’ and ‘secret tips’ functions are the icing on the cake! Download it now!!! !